The Bloodvein River within the planned heritage site. A massive tract of boreal forest straddling the Ontario and Manitoba borders that is known as the “Land that Gives Life” to the Anishinaabe people is recommended to become Canada’s first mixed World Heritage site. Story here. Manitoba's new Premier, Brian Pallister, has been making noises he may skuttle Bipole III, a major energy corridor being built on the west side of Lake Winnipeg. This would seem to leave a route EAST side as an option once again! What would this do to the plans for the Heritage Site? It would be a tragedy if this puts it in jeopardy. (re:Wpg. Sun, 4 Sept. East-side clarification letter) I know the previous Manitoba NDP gov. had been poked at for their present action plans of Bipole 111 down the west side rather than the shorter and less expensive eastern route. I have also read, that Doer, when premier, committed 10 million $$ to the Unesco designation. This most recent letter, tells a different story. Is the Conservative government leader aware of this, or does he care, and only wants to keep stirring the proverbial pot? Re: "East-side road," Letters, Sept. 3, 2015. Winnipeg Sun Newspaper. We don't want Bipole 111 in our traditional territories. I want to clarify a comment in regard to the east-side road. I've lived all my life on the east side of Lake Winnipeg where we have access to an all-season road. The NDP government didn't make the decision to submit for a Unesco designation in our area. 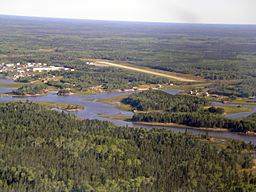 Five First Nations initiated this process with the support from the NDP. A few years ago, Manitoba Hydro came to our community with the Bipole III proposal and did consult with us. In the meeting, there were ideas shared of what the people wanted in exchange for the project. There was mention of partnership, alleviated costs in hydro bills and none of these ideas were accepted by Hydro. The community told them there and then, if you don't want to listen to our ideas, then move on -- we don't want Bipole III in our traditional territories. A big example of a big corporation wanting to take and giving nothing back in return.